(SKNIS): Floyd Buchanan and Kevaughn David can take their respective daughters on several adventures, courtesy the Department of Youth Empowerment and the sponsors of last month’s Build Together: Father-Child Sand Sculpting Competition. The young men received their prizes on Wednesday (June 08) during a brief ceremony at the department. 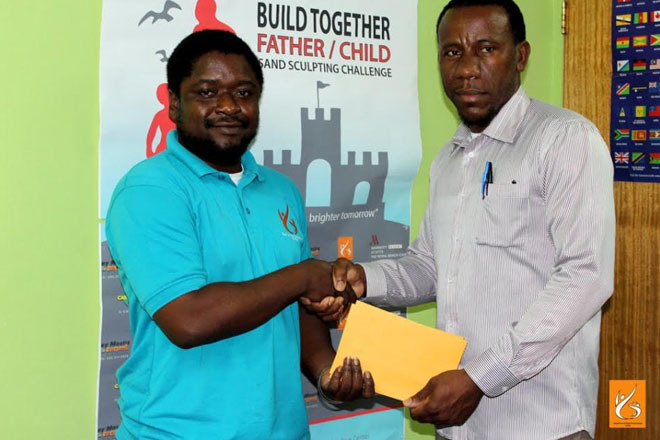 Youth Officer, Jermaine Pemberton, presented the gift vouchers. He said the sand sculpting challenge offered a new avenue for fathers to connect with their children. Mr. Buchanan said the event met its goal and he commended the department for finding creative ways to strengthen families. The two families now have the opportunity to spend more time bonding over activities offered by the St. Kitts Scenic Railway, Sky Safari and others. Mr. Pemberton singled out the sponsors that supported the inaugural sand sculpting challenge. The Build Together: Father-Child Sand Sculpting Competition was held at North Frigate Bay Beach on May 15.